Dr. Marvin Dunn surveys the Roots in the City garden and market. 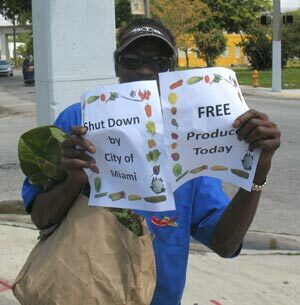 The Roots in the City Farmers Market in Overtown opened on Wednesday Dec. 8th for its second season. You may remember that it ran for a couple months, March and April, earlier this year. Now it’s back at the same corner of NW 10 St. and 2 Ave. in Miami, and it’s grown a bit bigger with two new vendors, Gardens of TROY and Nature Boyz. The same growers from the first time are there also — RITC Gardens, Teena’s Pride, Redland Organics and Hani’s Mediterranean Organics. The first day of the season called for Grand Opening festivities and VIPs. It wasn’t as crazy a party as last spring, but all the important people were there — chef Michael Schwartz, chef Michel Nischan, a PBS video crew, Farmer Margie and her intern Liberty, students from nearby Phyllis Wheatley Elementary, Dr. Marvin Dunn, Teena and Michael, an assortment of foodies and neighborhood shoppers, and most of the food bloggers in town. 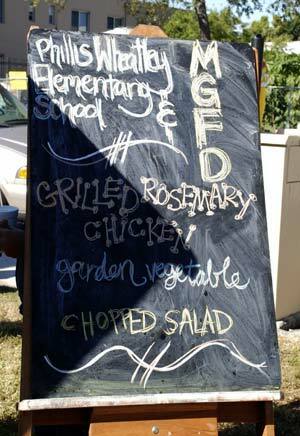 Market co-founder and chef Michael Schwartz brought his food cart, and his crew dished out grilled rosemary chicken garden vegetable chopped salad, which was quickly devoured. The recipe was created by a student from Phyllis Wheatley Elementary, where chef Michael recently visited, as part of the new Chefs Move to Schools program.Schwartz’s market partner, chef Michel Nischan, loped up and down the row of tents, stopping to greet growers and shoppers. Michel’s foundation, Wholesome Wave, donated matching funds to use with SNAP aka food stamps, good for up to $20 per person per day. 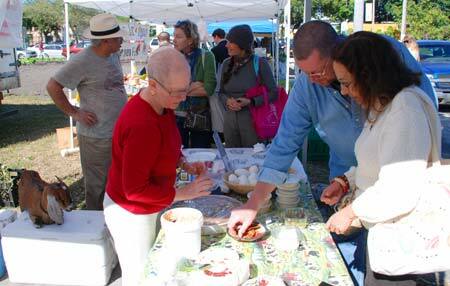 Last season, a large number of people used the matching funds tokens to supplement their shopping.Chef Michel Nischon (plaid shirt) is trailed by producer Jon Crane and his crew, while farmer Margie Pikarsky looks on. Chef Michael Schwartz chats with Ben Thacker, Jepson Jean-Pierre and Antonio Moss from TROY Academy, while Alexandra Rangel videotapes. Michael Schwartz stopped by to chat with two TROY Community Academy students and Ben Thacker, their gardening program director. Some of the things for sale at their tent were callaloo, carrots, passion fruit, aloe plants, and garlic chives. “Each kid has his own garden,” Ben said, “and they get to keep the money from selling their crops. All the kids are eating it.” Michael replied quickly, “Don’t eat it, sell it!” Ben said, “We’re trying to get them to eat more fruit.” “Ok, eat it!” Michael responded. The students laughed. Videographer Alexandra Rangel hovered nearby with her camera, capturing the conversation for a promotional fundraising video for TROY. Several large, perfect cabbages at Teena’s Pride tent caught my eye, along with exotic looking pattypan squash. There were red round tomatoes, cucumbers, and an assortment of other veggies and fresh herbs. All those and more can be yours on a weekly basis if you join the Teena’s Pride CSA. It’s not too late to sign up, and there are about 100 spots left. For prices and details, email farm@teenaspride.com or call 786-243-1714. Marguerite the Nubian goat hangs out with Hani Khouri and his wife Mary Lee, while customers sample fresh goat cheese. Over at the other end of the market, Marguerite the Nubian goat was hanging out with her humans, ice cream and cheese makers Hani and Mary Lee Khouri of Hani’s Mediterranean Organics. Of course everybody had to come over to take pictures of the goat… pet the goat… sample the ice cream… maybe get a falafel wrap… At the next tent, Farmer Margie had a large array of fruits, vegetables and herbs. She’s also set up to take SNAP funds and credit cards. It was a pleasant afternoon in the neighborhood, and the most important people there were the people who live in the area shopping for fresh food. During the spring, the beginning of market was slow but by the end of the second month, a good number of regulars from the neighborhood came by. 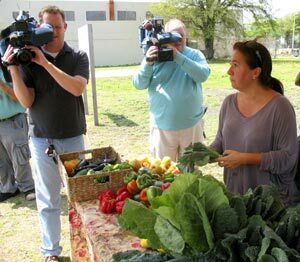 If things go like last season, every week will draw more people out of their food desert to partake of locally grown bounty. 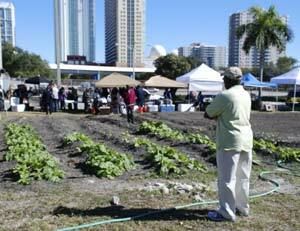 This season’s grand opening of the Roots in the City Farmers Market is on Wednesday Dec. 8, from 1 to 4 pm. 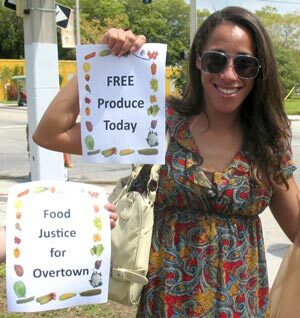 The market will be held in the same place it was last year, on the corner of NW 10th St. and 2nd Ave. in Overtown, right by the RITC gardens. This market is one of several in the area where real growers (not produce re-sellers) are participating. Returning this season are RITC itself, selling collards, papaya and other delicacies from its gardens, Redland Organics, Teena’s Pride and Hani’s Mediterranean Organics. The RITC Farmers Market was also the first market in the area to accept SNAP/EBT payments, and doubles the value of purchases up to $10, thanks to a generous program sponsored by Wholesome Wave Foundation. This season the market will be open two days a week, Wednesdays and Fridays. It will stay open through April 2011. For more information, email RITC or call 305-772-3229. The rescheduled and much awaited CNN report on the Roots in the City Farmers Market aired last night on Anderson Cooper 360. Did you miss it? (I did.) You can watch it online here, on the AC360 blog. Catch a glimpse of our fruit expert Melissa Contreras explaining tamarind to CNN correspondent John Zarella and Chef Michel Nischan. 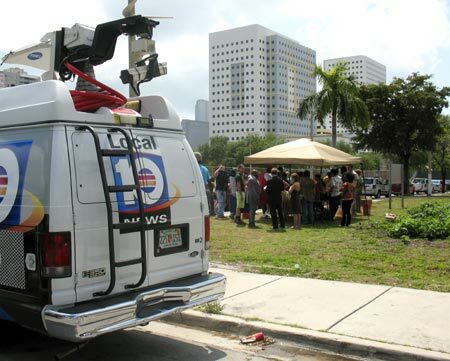 Correction: The CNN report on the Roots in the City Farmers Market has been rescheduled and will air on Tuesday May 4 at 10 pm on the Anderson Cooper show. The media — most recently national TV news, along with local newspapers, TV and local food blogs — has been all over Roots in the City Farmers Market. It’s a small market, just four or five tents by the side of the road in a very poor neighborhood. From a distance it doesn’t look too special. But it is, and that’s why the media keeps coming back. The big deal is that the Roots market is the first farmers market in Florida specifically created to use the Double Value Coupon Program, funded by Wholesome Wave. The coupons enable people purchasing with food stamps (SNAP/EBT) to buy twice as much, up to $20, using special tokens. The program is already in 80 markets in 12 states, but those markets already existed and had food stamp program in place before Wholesome Wave came in. Melissa Contreras (left) explains tropical fruit. 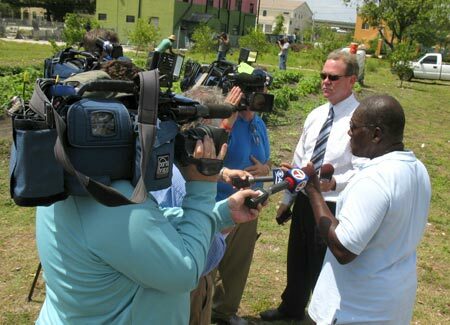 National TV news visited last week. On Wednesday April 21, a CNN crew consisting of reporter John Zarella, his cameraman Mike, and a field producer who was darting around with a notebook, hung out at the market all afternoon. Most of the people who created the market were on hand for interviews. 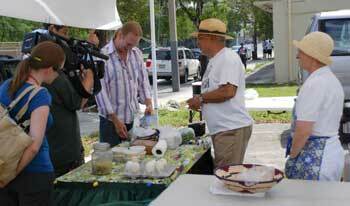 Founder and Chef Michel Nischan chatted with a lot of enthusiasm on camera. Chef Michael Schwartz and Dr. Marvin Dunn (and several family members) were on hand for interviews, along with people from the Human Services Coalition. A school group came by, and the kids looked at, touched and tasted different fresh vegetables. Several people who came to shop were also interviewed. Some came over from downtown (where more than half of the shoppers are coming from), and some from the neighborhood. Melissa Contreras, who was helping out at the Redland Rambles tent, spoke on camera about different tropical fruits — tamarind, canistel and black sapote — that were available. Farmer Teena Borek sliced up a hothouse cucumber and was handing out samples, and suddenly everyone around was eating cucumber and liking it. 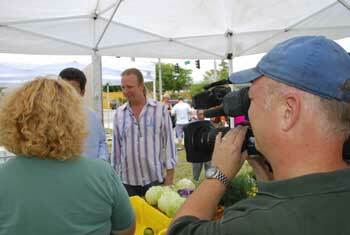 Mike the cameraman was bedazzled by pretty vegetables and took lots of video of carrots. And cucumbers. And greens. Zarella stopped to buy a small bottle of tupelo honey from the Redland Organics tent before they wrapped up for the day. 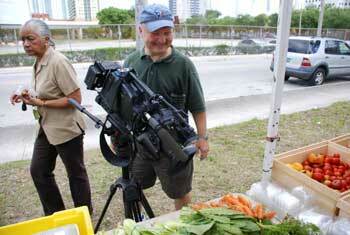 Mike the cameraman really likes carrots. The market has plenty of funding, and is gradually picking up steam. According to Caitlin McLaren of the Human Services Coalition, the Wholesome Wave Foundation gave them a grant of $11 thousand to pay for tokens and farmers. By the fourth week of the market, they still have plenty of money left, having spent about $400 in matching funds. It’s taken a while but the market finally has more EBT than cash sales. Farmer Margie said that about half her sales are EBT and she’s getting regulars. “One lady was already here at 12 waiting while we were setting up,” she said, and added that several homeless people come by from week to week to get food. Douglas Dunn, who helps run the Roots community garden, explained “The market attracts a lot of white Hispanics. About 70 per cent of the customers work close by and drive by, or have read about it in the paper. It’s going to take some time to get the word out.” As Douglas explained that to me, a man walking across the street called out, “Do you take food stamps?” Yes was the answer. The man stopped for a moment, said he’d be back and headed down the street. Hani and Mary Lee talk about goat milk ice cream on camera. 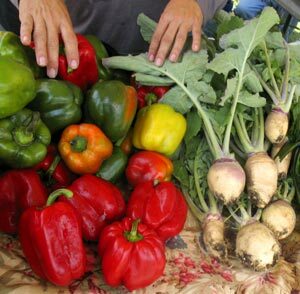 Unfortunately the growing season is winding down as the weather gets hotter, and the market will close sometime in May. There might be fruit sales in the summer, but that isn’t certain yet. It all depends on what the farmers have to sell. Market manager Maggie Pons said they’re definitely going to be back in the fall. Hopefully the market will take off, for the sake of the people who need it the most.